Star Spangled Baby Shower for a Cause! Recently Green Team was honored with the opportunity to donate to a great Baby Shower for a Cause! 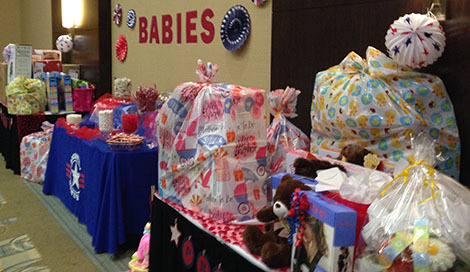 This baby shower, located in Virginia Beach, was put together buy Operation Homefront. Operation Homefront is a national 501(c)3 non-profit organization that provides emergency financial assistance to service members, Wounded Warriors and their families. The baby shower was organized for 150 moms who will be welcoming 150 babies into the world whose fathers are wounded, deployed, or servicing our country. Green Team was excited to be able to present each attending mom with a copy Kelly Wels, Changing Diapers: The Hip Mom’s Guide to Cloth Diapering book! This Baby Shower was a great success. For more information please visit this recent news article. This entry was posted in Blog and tagged baby shower, chairty, in the news, operation homefront. Bookmark the permalink.